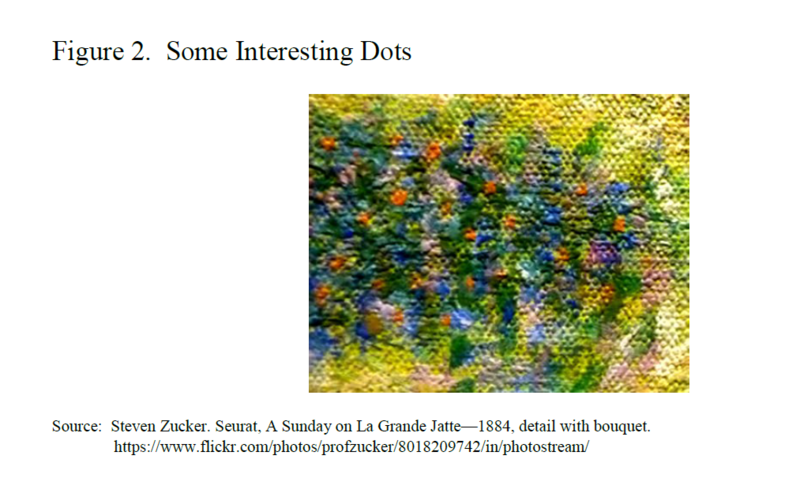 Don’t look too closely at the Fed’s dot plot or you might miss the larger monetary policy picture, warned Federal Reserve Chairman Jerome Powell in a 3/8 speech titled “Monetary Policy: Normalization and the Road Ahead.” To make his point, he showed two unusual images: an unrecognizable close-up of a bouquet of flowers from impressionist painter Georges Seurat’s “A Sunday Afternoon on the Island of La Grande Jatte” and a very recognizable image of the full painting. Monetary impressionists may not be seeing the forest for the trees, to mix up the metaphor. The Fed began issuing its Summary of Economic Projections (SEP) for the next three years and longer run back in 2007, specifically with the 10/30-10/31/07 Federal Open Market Committee (FOMC) meeting materials. Included in the SEP is the “dot plot,” which reflects each participant’s view of the appropriate federal funds rate trajectory “in the scenario that he or she sees as most likely,” according to Powell. The scenarios outline participants’ outlooks for the unemployment rate, the pace of real GDP growth, and the inflation rate. (1) Collateral confusion. This is not the first time that a Fed chair has provided Fed watchers with an art class on interpreting the Fed’s dot-based pictures of monetary policy. In his speech, Powell reviewed two previous instances. In 2014, the dots caused “collateral confusion,” according to the then Fed Chair Janet Yellen, when the markets misread the Fed’s intentions. She stated that what matters more than the dots is what is said in the FOMC Statement released after each meeting. (2) Bullard’s missing dot. Powell didn’t specifically mention him, but St. Louis Fed President James Bullard, a current voter on the FOMC, has questioned the usefulness of the dots for some time. Since 2016, Bullard has opted out of providing longer-run projections, the only participant to do so. He explained why in a paper, contending that switches among monetary policy “regimes”—and the possible future macroeconomic outcomes they may lead to—are not forecastable beyond 2.5 years. (3) FOMC’s flexible course. Perhaps Bullard led the FOMC participants in an impromptu discussion about the dots during the January 29-30 meeting? According to the Minutes: “A few participants expressed concerns that in the current environment of increased uncertainty, the policy rate projections prepared as part of the Summary of Economic Projections (SEP) do not accurately convey the Committee’s policy outlook.” It was the first time that the minutes suggested that this subject had been discussed in a FOMC meeting. 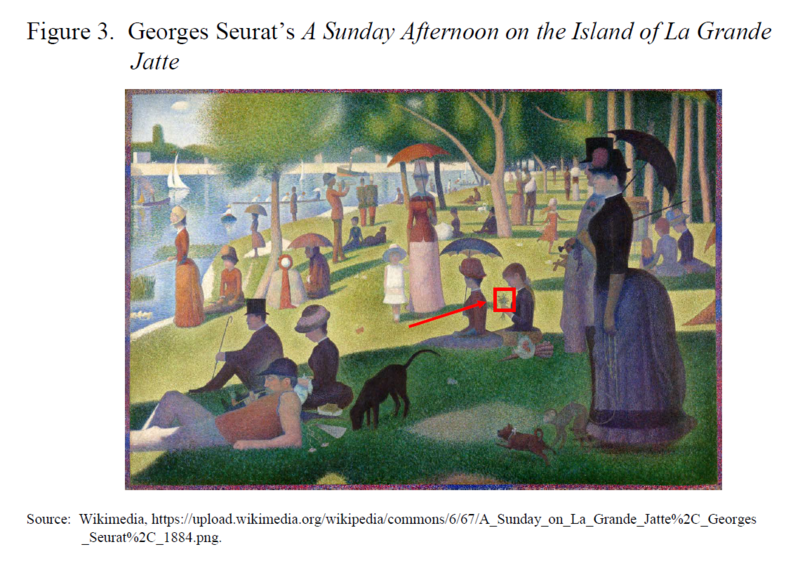 These participants were concerned that “the public had misinterpreted the median or central tendency of those projections as representing the consensus view of the Committee or as suggesting that policy was on a preset course.” In other words: The public doesn’t understand impressionistic art, so let’s stop showing it to them! (4) A suggestion. We are not fans of the dot plot. We think that a data-dependent approach is the most sensible way to run monetary policy. Nevertheless, the SEP does provide some useful insights into the heads of the Fed heads. While the words of Fed officials along with the FOMC Statement and the Minutes help to paint the larger picture of monetary policy, it would also be helpful if the estimated probability of occurrence associated with each of the participants’ projections was indicated within the SEP.
(5) Spot off. Barring an unexpected inflation surprise, we are fairly certain that the Fed will continue to be patient and not raise rates until at least the end of the year. One thing we are absolutely sure of: We won’t be gazing at the Fed’s upcoming release of the dot plot for the 3/19-3/20 FOMC meeting for very long. We’ll take Powell’s advice and view it with a cursory glance and from a few steps back. In any event, given that the dot plot hasn’t been spot on in a very long time, we won’t be upset if the Fed deletes the dots in the future. Previous Happy Birthday to the Bull Market!